Underneath Their Robes: Justice Joy Clement: "Happy Happy Joy Joy," or Justice Souter in a Dress? Justice Joy Clement: "Happy Happy Joy Joy," or Justice Souter in a Dress? Recent reports suggest that Judge Edith Brown Clement of the Fifth Circuit is about to be nominated by President Bush as an Associate Justice of the Supreme Court, to replace Justice Sandra Day O'Connor. Profiles of Judge Clement are available here, here, and here. What is A3G's take on Judge Clement? To be fair, A3G needs more information -- please email her ASAP with juicy tidbits about Judge Clement. A3G's initial reaction: Judge Clement is kinda boring, a far cry from such spectacular judicial divas as Judge Edith H. Jones (5th Cir.) or Judge Janice Rogers Brown (D.C. Cir. ), two other possible SCOTUS nominees. As noted in her OLP bio, Judge Edith Clement was a maritime lawyer for about 15 years. 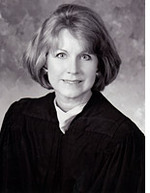 In 1991, after nomination by the first President Bush, she became a district court judge for the Eastern District of Louisiana. She served as a district judge (including a stint as chief judge) for 10 years before her 2001 elevation to the Fifth Circuit. YAWN! To be sure, Judge Clement appears to be highly competent. As noted here, "[a]s a district court judge, out of more than 1,300 opinions she authored, only 17 were reversed, partially reversed, vacated or even remanded." Her undeniable competence may explain the 99-0 vote to confirm her to the Fifth Circuit. abc news reporting that it's NOT clement! definitely boring. she also would be the first non-HYS justice on the modern SOC. she would be the first to be entirely bred in the south ... even CT went to yale then dc after Georgia spat him out. What do we know about Judge Edith Brown Clement that suggests she deserves to be a Supreme Court justice? Judge Clement seems extremely competent, but is she Supreme Court material? Technical ability only takes you so far. What kind of legal thinker is she? CNN: Judge Clement's clerk simply says that the Judge "is unavailable" when the press calls her chambers. Who are Judge Clement's clerks? Someone who reads this knows them. Squeeze them for answers and report back!